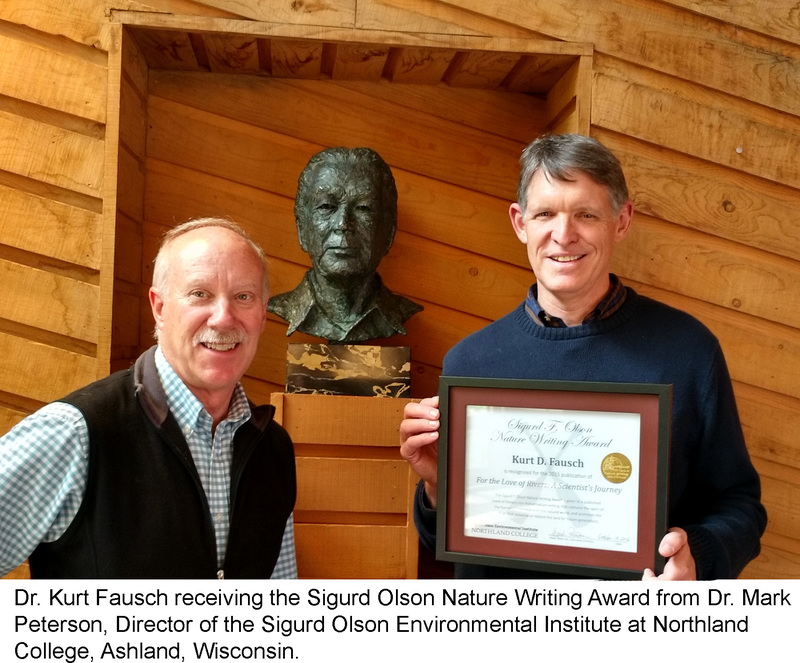 We are joined by author Kurt Fausch today in celebration of his being awarded the Sigurd F. Olson Nature Writing Award (SONWA) for his book, For the Love of Rivers: A Scientist’s Journey. Today we get an inside look into how close to home this award hits and the experiences building his career in conservation biology—serving as the acting Director of the Graduate Degree Program in Ecology at Colorado State University (CSU) and also as a professor in the Department of Fish, Wildlife, and Conservation Biology at CSU. I have never forgotten the sound of the loons, and of waves lapping ashore at night just before one drifts off to sleep. I grew up making annual peregrinations between the suburbs of the megalopolis of Los Angeles where we lived and went to school, and north central Minnesota where we spent summers building a cabin on a small piece of shoreline of a pretty large lake. My parents were natives of the Land of 10,000 Lakes, and my mother loved lakes dearly. They both knew that we all needed respite from the choking smog and frenetic pace of southern California. A clear memory is sleeping on a cot in the walkout basement, hearing the haunting high forlorn calls of loons, and looking out across the bay to see the moon’s reflection being jostled in the waves. The sound of those waves is the last thing you hear before sleep swallows consciousness. Back in California one year, when I was about 13, I noticed a book on my parents’ shelf titled Listening Point. I had never heard of Sigurd Olson, butI was immediately attracted to the beautiful drawings that graced each chapterheading – pictures of canoes and campsites, loons and portages, and long vistasdown lakes in the border country between northern Minnesota and the vast Canadian Shield to the north. We had visited that country for a week every year, because my father’s sister owned a small cabin perched on the north shore of Lake Superior, a steep, rocky shoreline dashed by waves and shaded closely by spruce and fir. From there we ventured berry picking and fishing in the lakes that bordered the Boundary Waters Canoe Area (BWCA). I fell in love with the cold, crisp air and the stark rocks and waters of this lonely land, so recently scoured by glaciers which left many deep cold lakes, and swift streams tumbling south into the largest lake in the world. Olson wrote not only of the adventure of canoe trips deep into this wilderness, but also of reverence for this land and these lakes, and why they are important for the human spirit. My first reading of Listening Point, and then other books of his like Runes of the North and The Singing Wilderness, left me entranced with the idea of canoeing in this vast wilderness, traveling along routes plied by voyageurs 300 years earlier. The romance of paddling through these chains of lakes, camping along their shores and fishing in pristine waters led me to work for an entire year at age 15 to earn enough to buy my own canoe. I papered my bedroom wall with the entire set of maps of the BWCA, and pored over the canoe routes through the chains of lakes. I knew that “when I grew up”, I wanted to study fish and become a fisheries biologist. Lakes in northern Minnesota would be the perfect place. My chance to start this adventure came in 1968. On our way to my aunt’s cabin on “the shore,” we visited the campus of the University of Minnesota in Duluth (UMD), where my older brother was considering attending college. He chose elsewhere, but I knew that Duluth was where I wanted to attend college when I came of age. After my sophomore year at UMD, I landed a summer job as a fisheries biology technician in the BWCA. My partner and I were responsible for surveying the fish and habitat in about 30 different lakes. We spent an entire summer traversing those waterways with boats and canoes, setting nets to sample fish, measuring water chemistry, and mapping shoreline habitat. The next year I did similar work on Lake Superior and several large lakes, focusing primarily on lake trout. I thought I had died and gone to heaven. And in those same years, I purchased and read all nine of Olson’s books, seeking in his writings a deeper understanding of the history and meaning of this wilderness and its lakes and rivers. In my reading since, I learned that Olson was a contemporary of Aldo Leopold, and indeed turned down a chance for further graduate study with him to earn a Ph.D. Instead, Olson returned to the North Country, taught at a junior college, and focused on advocating for this wilderness and writing essays about its values. He was at the forefront of those who fought to prevent roads to every lake starting in the 1920s, and in the 1940s to prevent aircraft flights that would bring anglers and canoeists deep into the wilderness. He knew from long experience as a canoe guide starting in the early 1920s that this wilderness had great value for the human spirit, but that these values could only be accessed through the hard work of paddling and portaging and camping in primitive places. He saw doctors and businessmen and lawyers and judges transformed from their harried state to people who could appreciate solitude and sunsets, and who pondered again the ancient ideas that only wilderness can evoke. One day during my senior year in college I attended a talk on wilderness. I recall taking a seat near the back of an auditorium. 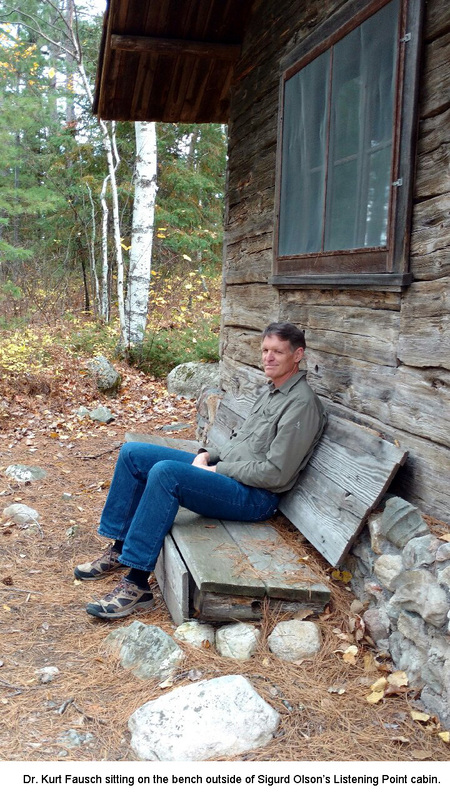 Looking to the side, I was amazed to see sitting two seats away the man I recognized as Sigurd Olson, a man I would have given anything to talk to. Being rather shy, I didn’t say anything, but felt privileged just to be near him as we both listened to a talk that was probably like many he himself had given. I later realized that Sigurd Olson was in his late seventies then, and passed away six years later, while snowshoeing in the land he loved. I now realize that Sigurd Olson’s essays have always been a touchstone for me, and for the career that I myself have created as a fisheries ecologist. My opportunity to study fish was not in lakes, but in streams, and so I now have a deep love for both. My journey led me throughout much of the West, and to northern Japan. As a scientist, I have seen many rivers, learned their inner workings, and developed a philosophy about why they are essential for humans. But my recent reading of Olson’s early essays on the meaning of wilderness, unavailable to me during my college years, has revealed that he arrived at many of the same ideas far earlier than I. In fact, his idea that modern humans seek habitats like those in which early humans evolved may have formed the basis for some of the theories advanced by other scientists, on which my work is based. On Earth Day 2016, the book I wrote, For the Love of Rivers, was honored with the Sigurd Olson Nature Writing Award. I am still utterly astounded by this. I can’t imagine a higher or more meaningful honor for my work. But only after re-reading Listening Point, and traveling back to Ashland, Wisconsin to speak and receive the award at the Sigurd Olson Environmental Institute at Northland College, did I realize how much the course of my entire career, and my approach to writing this book, were influenced by Olson’s essays and books. I even spent an entire year working with artist Kristine Mackessy to create the pen-and-ink drawings that grace the chapter title pages, showing her the images from Olson’s books as examples of what I sought. Who knows how what one writes or speaks, or what actions one takes, will affect others? Every professor like me has the chance after a long career to see their legacy through students who were influenced by things they said or did – often not realizing what different messages each person would draw from one’s teaching, writing, or working. 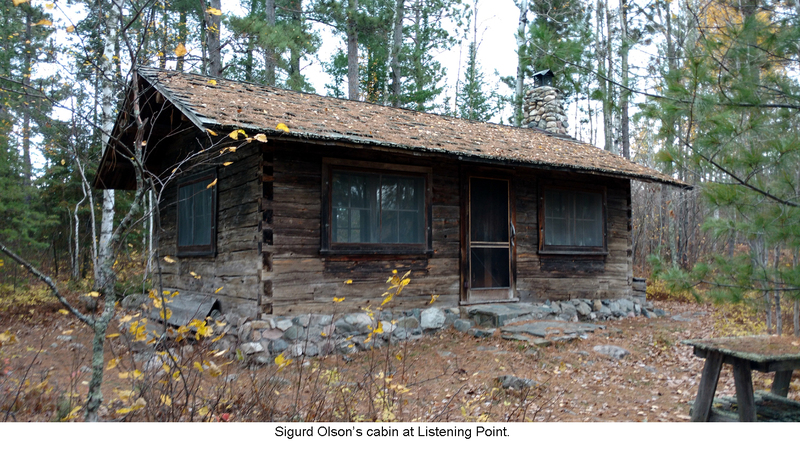 Sigurd Olson influenced several generations of people through his best-selling books during an era when the environment came to the fore, and influenced both presidents and policies that conserved many tracts of wilderness, including the BWCA Wilderness. But he also influenced me personally, and for that I am forever grateful. If the book I have written can influence someone else to seek their own path forward and cherish lakes and rivers, especially those in wilderness, then it will have been an amazing success. 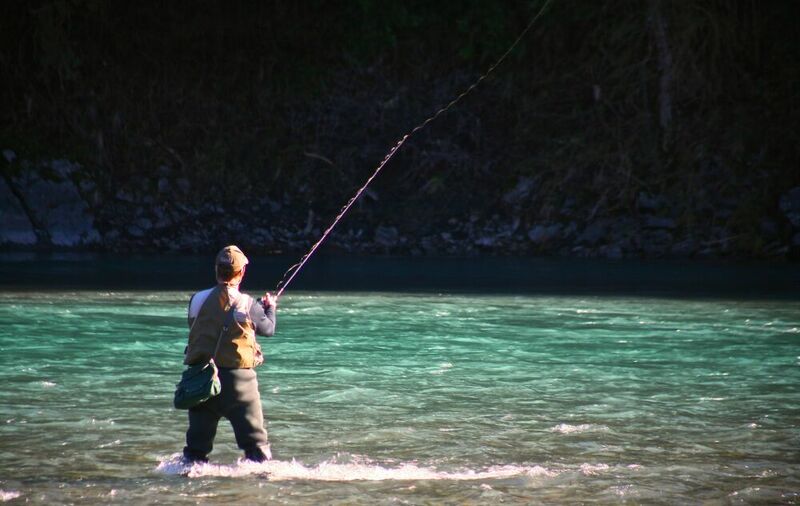 Author and photographer Tim Palmer, author of Rivers of Oregon, joins us again today to share his experience travelling down the Chetco River, which provides a lively contrast to his journey on the gentle waters of the Willamette. 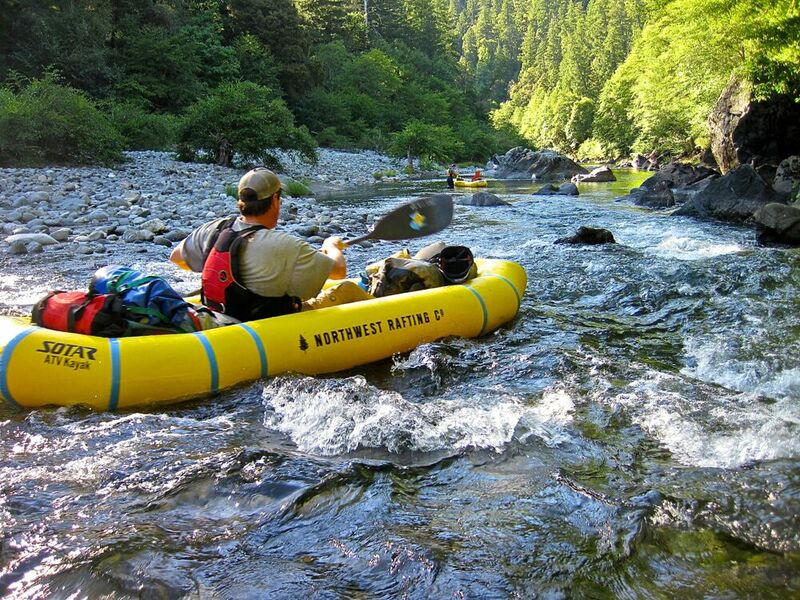 The Chetco runs an expanse of approximately 57 miles. However, much of the river runs wild. In today's piece, Tim gives readers the chance to encounter the sights found in these 57 miles, allowing us to glimpse into the often-unseen wild of the Chetco. At the beginning of my book, Rivers of Oregon, I reflected on a journey down the Willamette River, gently winding through the heart of Oregon's most populated valley. Plentiful flows whisked me past shores constrained by farmland but still green with cottonwoods. The riparian artistry that I found will enchant anyone who drifts with the current and notices what's there. 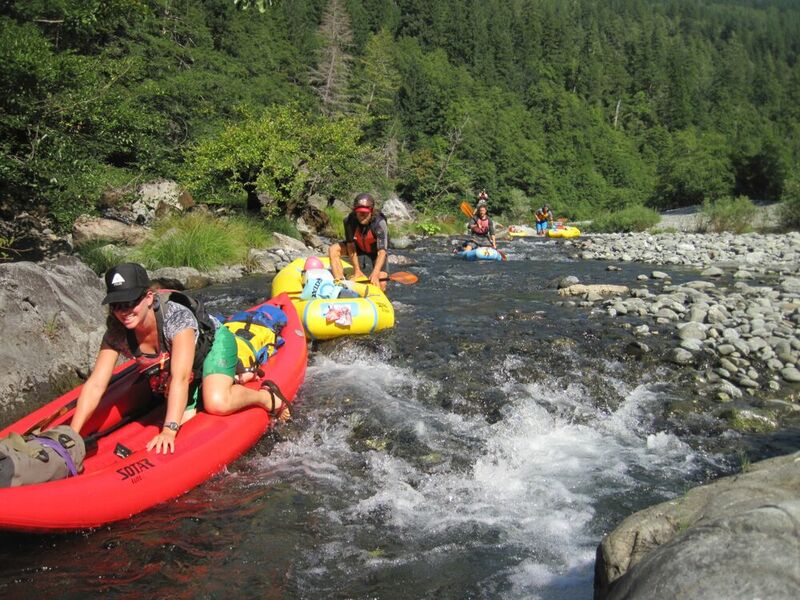 For a counterpoint to the Willamette's welcoming ease of travel, I journeyed with my wife, Ann, and a small group of friends to one of Oregon's least tamed and most remote rivers, the Chetco. While upper reaches of that coastal stream are all wilderness, and visiting requires a long hike, an isolated mid-section can be reached by a rough road leading to a remote riverfront. There we unpacked our inflatable kayaks, strapped a waterproof bag of supplies onto each, and began to paddle-- not downriver-- but up. We wanted to see the nature of an extraordinary canyon, and our boats offered the only way to go. We paddled through pools that were crystalline and so deep we could not dive to the bottom. Then we dragged our gear over boulders and gravel bars up to the next pool, again and again. We passed the mouths of tributaries feeding pristine waters into the river. We encountered cliffs and tangles of fallen cedars as we pressed onward for several miles to Boulder Creek and the Kalmiopsis Wilderness-- among the first Wilderness Areas designated in America and the third largest in Oregon. We camped on the gentle slope of a gravel bar where evergreens shaded our tents and where the Chetco shimmered past, its music entertaining us from rapids both above and below. While the Willamette had offered me a comforting tour through Oregon's heartland with farms and towns along the way, the Chetco was as wild as it gets. The next day we began our descent, passing our put-in point and continuing downstream for another two days through lower canyons. We dropped over dozens of rapids that would have been threatening in the flush of springtime, but on low summertime runoff we slipped through, or bounced off rocks in our forgiving air-filled craft, or clamored over slippery rocks, lugging our gear and pairing-up to push and pull our boats. Two impressive bottlenecks required portaging over boulders the size of cars and busses. The first was an extravaganza of maroon, white, and gray-striped rocks in a rapid called Radiolaria for the microscopic creatures that had fossilized to create those rocks undersea prior to the Coast Range uplift. Then Conehead's radical drop-- shaded by two pointed monoliths and clogged with logs-- demanded that we line our craft through narrow chutes and a slot barely boat-wide. Downstream from that last canyon, a more casual Chetco is easily reached along a forest road. Its refreshing riffles and deep green pools-- alive with spawning salmon in winter and swimming children in summer-- are no less beautiful than the wilderness above. It's a riverfront, like many in Oregon, where you can see a free-flowing waterway connecting mountains to sea, forests to fish, and people to the natural world around them. For other wild scenes and remarkable river adventures in Oregon I traveled to the Salmonberry, North Umpqua, and Collawash; the Metolius, Imnaha, and Wenaha. Whether we go exploring at these or the Willamette-- or any of the hundred rivers and thousands of streams in between-- Oregon is a wonderland of waterways. The rivers flow all around us. Enter the promotion code 16HOLIDAY at checkout by December 31st to get 25% off these titles! Last September, something truly amazing happened in Portland’s Forest Park. It was an achievement never before attempted. And, at its conclusion, it stands as an inspiration for many more to follow. On September 4 and 5, Alex Schay, set out to do a goal he had made for himself. He wanted to hike the entire Wildwood Trail, that winds 30 miles through the largest urban wilderness in the United States, and do it in two days. Other people have set and achieved this goal. Alex was not the first to do it. But one thing makes his goal unique, and never before attempted. You see, Alex Schay is blind. What’s more, the guide dogs for the blind, one of which is Alex’s faithful companion, Clifton, are only trained for city streets. Alex, who loves the outdoors, knew this was an important objective he wished to accomplish. With his beautiful and smart guide-dog, Clifton, they worked together, hiking easy places at first, then more complicated, to get Clifton used to exploring native trails. At last they were ready. 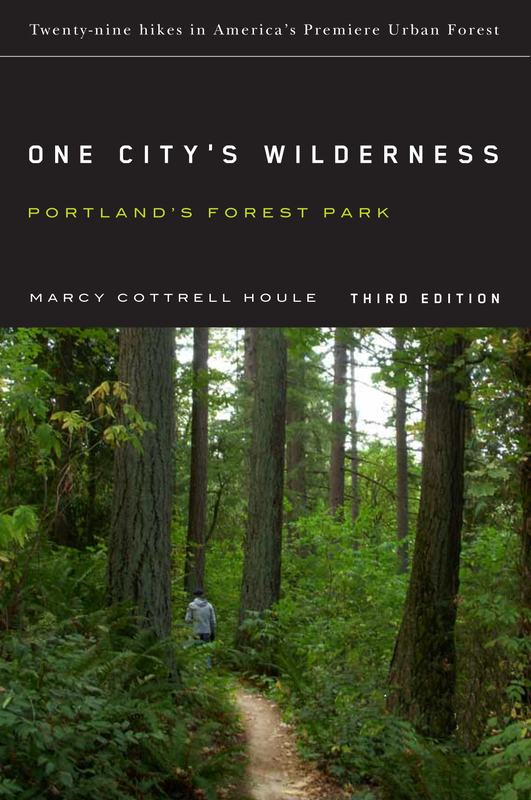 Alex contacted me to ask if OSU Press might provide him the Word documents for my book One City's Wilderness: Portland's Forest Park, so he could follow the trail descriptions written for Wildwood. He wished to use the book to get a better understanding of the trail, and information on trail crossings and connections. The Press gladly consented. Before long, Alex set off, attempting to walk the trail only with Clifton, as his companion and assistant. Alex also used a GPS-based app called Blind Square, to help him be aware of and navigate various trail crossings in Forest Park. On Sunday, September 4, Alex left the zero-mile marker for Wildwood Trail, at the Vietnam War Memorial. He covered half the park, contending with “washed-out bridges or sections of trail, overhangs, and roots and rocks too numerous to mention.” On Monday afternoon, September 5, he successfully reached Wildwood’s conclusion at NW Newberry Road, near Sauvies Island. He reached his goal, hiking 30 miles of the nation's longest hiking trail in any city -- Wildwood Trail. He hopes his terrific and brave success will only be the beginning. 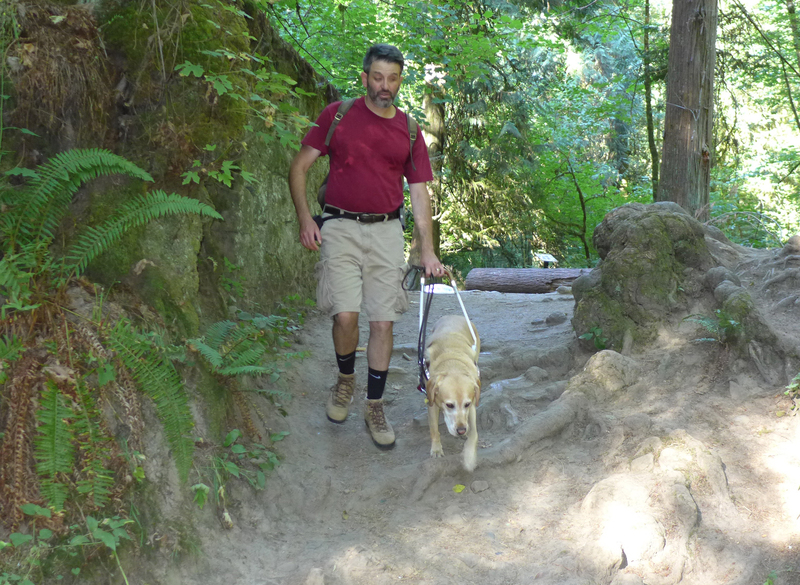 He encourages other blind hikers to attempt the hike, using the aides he did, and find the great satisfaction of facing a challenging goal and connecting with the beauty of nature. Congratulations to Alex! Below is a letter he sent to friends and supporters after the hike. Alex’s story is also featured in a recent NW Examiner article. I thought that some of you might be interested to learn that on Sunday & Monday, September 4th & 5th, my guide dog, Clifton, and I made a successful independent hike of Forest Park’s Wildwood Trail. We began at the Vietnam War Memorial near the Oregon Zoo on Sunday morning, and came out at NW Newberry Road near Sauvies Island Monday afternoon. At just over 30 miles in length, the Wildwood Trail is the longest contiguous urban trail in the United States, crossing numerous watersheds. Many tools and techniques enabled a successful hike. First, I used textual descriptions about the Wildwood Trail, taken from Marcy Houle’s book, One City’s Wilderness, to get a general understanding of the trail, as well as an understanding of some of the trail crossings and connections. Thank you to Marcy! Mike Yamada from the Oregon Commission for the Blind may also be gratified to learn that Blind Square, a GPS-based app that helps blind people navigate and understand their surroundings, may be used to determine the proximity of various trail crossings in Forest Park. Blind Square can also announce upcoming trail crossings, which can be quite helpful. I was also able to consult with other hikers to confirm that I was on the right track, or to get back on track. And of course, Clifton did an amazing job focusing on details, like washed-out bridges or sections of trail, overhangs, and roots and rocks too numerous to mention. I am revising Marcy’s textual description of the Wildwood Trail so that it can be an even more effective tool for blind hikers, giving more blind people access to Portland’s remarkable Forest Park. Dr. Robert Michael Pyle, author and lepidopterist, shares with us today an essay that wasn't selected for the final draft of his new book, Through a Green Lens. With the book spanning his entire career as a writer, difficult decisions had to be made concerning which pieces would and would not reach republication through the Press. The piece we share with you today, Ripples Through a Pool of Meltwater, explores his experience with the Northwest Forgotten Language tour in the Columbia River Gorge. Pyle provides readers with insight into the choice not to include Ripples Through a Pool of Meltwater and a reflection on the essay itself. Through a Green Lens: Fifty Years of Writing for Nature brings together 47 essays selected from my entire life's work as a writer, to date. All but one (the first, just out of high school) have been published previously, and almost all in the periodical press. A few came from anthologies or books for which I wrote forewords or chapters, but none from my own stand-alone books (a reader drawn from these will comprise a future collection). As there were many more pieces to pick from than we could possibly include, it was necessary to make hard choices. We wanted both coherence and diversity, without too much overlap or repetition. We wanted to include only pieces that could argue for themselves that they had a reason to live on. We wanted the whole to be concise enough so as not to suggest a telephone book. This meant that there would be a good many out-takes. Some of these were judged to be too ephemeral, dated, or narrow for general interest. Others were held back for another book of longer, philosophical essays. But there remained a residue of pieces I might have liked to share again with a broader audience than those who saw them in the first place. One such essay was called Ripples Through a Pool of Meltwater. It was originally published in 1995 in a pre-blog newsletter associated with Orion Magazine called the Orion Society Notebook. I rejected it from the book partly because of its length, although we did include some other very short pieces; and because its subject, the late, great barnstorming whistle-stops conducted by shifting knots of Orion writers to celebrate literature and the land seem a little narrow without an explanation of its history (such as its name, which came from W.S. Merwin's poem, Witness). But rereading it now, I find I still like some of its words, its images, and its conclusion--which captures, I think, just what we were trying to accomplish on those occasional magic carpet capers. It is short enough to include here in its entirety. When consummate Cascadian naturalist David Lukas led the Northwest Forgotten Language tourists up the Eagle Creek Trail in the Columbia River Gorge, the deep green mosses and the canyon's tracheae of ferns and liverworts breathed a moist awareness of life and regeneration into all of us, writers, students, and guests. When we reached the waterfall, sunstruck that February morning, I felt a distinct connection between the readers and the listeners, the text and the field, the Tour and the world. At the base of the plummet, rough ripples spread through a pool of meltwater. Days later, recuperating from the sweet rigors of the minstrelsy, that image returned to me. I realized that, as the wavelets went out into Eagle Creek, so spreads the gentle impact of the Forgotten Language visits: barely noticeable in the general clamor, yet insistent and cumulative in their influence far beyond the source. In all the stops where I've been privileged to read for the Forgotten Language Tour, the field forays have affected me as much as the readings and the interchange they bring. I think of a remnant of old-growth forest as deep in rain as moss, on a bluff above Willapa Bay. A reclaimed urban landfill in Seattle, once again a vibrant habitat. A hardwood copse in western New York, colored like melted crayons heavy on the red. A Sonoran arroyo studded with saguaros, daubed with orange mariposa lilies and black buckeye butterflies. We've engaged the ground at least a little everywhere we've gone, even on horseback in Monument Valley, where our Navajo guides sang a prayer as raven circled overhead. Yet these are no junkets; the field trips refresh from grueling schedules, but comprise in themselves a key component of the Tour. Absent contact with the land, the words become sterile. Composted by the green tissues, brown soils, and moving parts of the biome, fine writings come alive, able to move others and make them care. This is what I hope we bring to those who hear us: a keen sense of the power of a language that must not be forgotten after all, and a parallel understanding that the words grow out of the land, where we must return to give them meaning. Beyond that, I believe our visits have the potential to stimulate action--application of the ethic implicit in the bond between the Orion writer and reader, reader and listener-- in direct ways that honor communities and help to preserve the fabric of the landscapes on which they depend. In The Gift, Vladimir Nabokov tells of physical sensations that are "utterly incomprehensible, like the words in a forgotten language." It is the job of these itinerant storytellers to render the world and its parts comprehensible, to find the land-word bridge to understanding. If we can help a few people to remember the language we need, they will tell it to others... and who knows what could happen next?